ParagonMeds is entering the long term care pharmacy and special pharmacy market. Paragon, with its already well-established and efficient operations, is in a unique position to service these markets saving them both time and money. 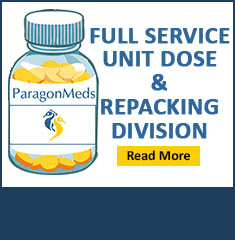 Paragon now offers LTC and specialty pharmacies better contract pricing as well as access to over 40,000+ products through their interactive website, shaving cost and time off the purchasing process. With expansion in mind, Paragon is making a significant investment in a team of sales representatives that can work with and deliver these advantages to LTC and Specialty pharmacies throughout the United States. Paragon recognizes that an aging U.S population that increasingly includes seniors on lifetime specialty therapies is driving greater demand for long-term and post-acute care in the nation’s healthcare delivery system. In addition to rehabilitation centers and pain management facilities, LTC pharmacies will play a growing role managing the medication and clinical needs of seniors with increasingly complex medical conditions and greater needs for effective medication therapy and management. To solidify its commitment and continue its dialogue with these pharmacies, ParagonMeds will be, for the first time, exhibiting at the ASCP’s Annual Meeting and Exhibition in Dallas, Texas this coming November.